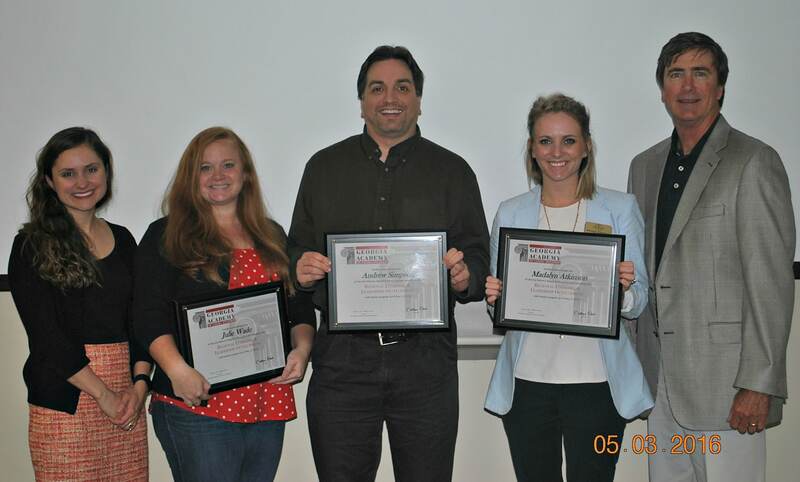 The Board of the Georgia Academy for Economic Development announces Putnam County graduates from the 2016 Region 6 Multi-Day Training Program. Class participants represented a number of professional and non-professional economic development fields, including elected officials, public servants, business leaders, educators, and social service providers from 10 counties in Middle Georgia. The Academy provided each of the graduates an opportunity to gain a unique understanding of the complexities of economic and community development on the local, regional, and state levels. Putnam County graduates at the May 3, 2016, ceremony included: Julie Wade, Madalyn Atkinson, and Andrew Simpson. Georgia EMC’s Vice President, Community and Economic Development (CED), Pat B. Merritt, CEcD says, “Our Community Development team is proud to partner with and provide facilitation and presentation services on behalf of Georgia’s electric membership cooperatives. Involved since its inception, the team’s work with the Academy graduates has enhanced levels of leadership capacity and community development preparedness for continued economic development progress throughout the Region.” In Region 6, CED cooperative members are Central Georgia EMC, Flint Energies, Oconee EMC, Southern Rivers EMC, and Tri-County EMC. “Georgia Power has historically played a major role in the State’s economic development. The Academy has formalized the opportunity to bring together stakeholders to share best practices, leverage expertise, and build relationships among our communities with the same goal in mind: ensuring economic growth and prosperity for our state. We are proud of the strong partnership that delivers this program in each of our regions every year,” says Georgia Power Company Community Development Manager Johnna Robinson, chair of the Georgia Academy board. The next Region 6 Georgia Academy for Economic Development will begin in February 2017. For more information on this, please contact Tonya Mole at 404-852-6876 or by email at tonya.mole@dca.ga.gov.